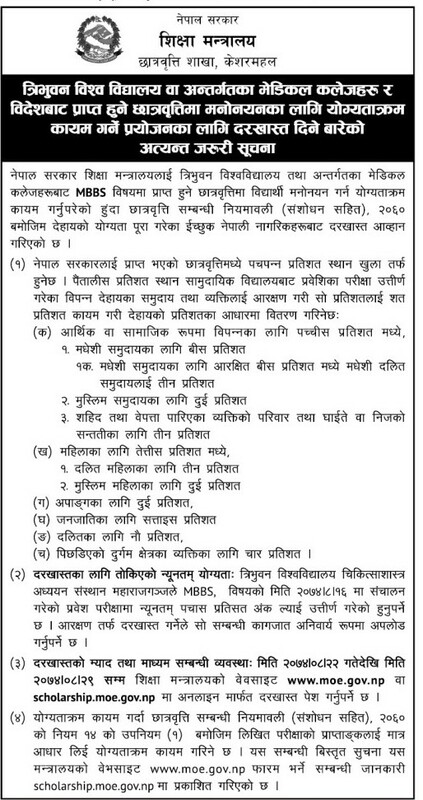 Ministry of Education (MOE) invites applications for Scholarship Seats in Tribhuvan University Institute of Medicine (TU IOM) Medical Programs in Constituent and Affiliated colleges for the academic session 2074/75. The Scholarship seats is granted for MBBS Programs at Tribhuvan University affiliated colleges. Scholarship Application can be done via MOE website from 2074/08/22 to 2074/08/29 period.